In this age of the million-dollar amateur, lucrative endorsements, media adulation and huckstering, there is, believe it or not, such a thing as a real amateur. Halberstam takes a small group of rowers and gives an in-depth picture of the Herculean effort necessary to win in a sport of which few know or care. Their athletic odyssey is part talent, part spirit, part theater. In these days of disposable celebrities, such young men are throwbacks to a purer time and are made of sterner stuff than our commercialized dolls of play. 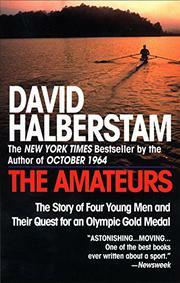 If you know nothing about the art of single sculls or rowing stroke, Halberstam will pique your curiosity. The rowers live in a universe dominated by the puritan ethic and circumscribed by the Ivy League, with some interesting exceptions. They are warriors, not merely athletes; Zen monks on a quest for perfection. Power and grace for their own sake motivate these men. Their ambition is to become part of a pantheon of virtually unknown "greats." Their coaches are aloof men; their comrades fierce opponents. This epic of dedication reaches its climax in the 1984 Olympics. The tragedy of veterans who fall by the wayside and the plight of outsiders who shoulder their way into rowing's closed world is quite moving. They undergo a ritual of purgation with ultimate glory for only a few. Even those who are not victors are content knowing that they have tested their limits, given their all. This is an unusual sports book about people of whom one grows inordinately fond. Some are arrogant, moody and touchy, but all are made of the fight stuff. They bring an unusual intelligence and style to the slender shells they propel so swiftly through the water. Though singularly obsessed by an ideal of strength and power, each of them is somehow very appealing. In writing about an arcane sport, the author tells us more about life than we had bargained for.